Splash pages - you gotta love 'em. A place where the penciller can hit the reader full-throttle, with a large dose of illustrated 'wow'. 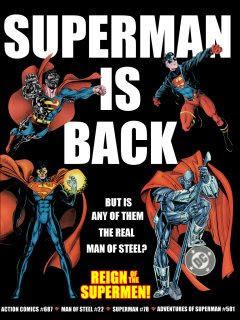 This week, one of my best spoiler-free splashies from Reign Of The Supermen - and the highly, highly, highly under-rated Karl Kesel. Reign Of The Supermen sucked loose change out of my wallet quicker than that annoying kid sucking the last drops of soda out of his cup with a straw. And while I've blogged before on how fellow Reign artist Dan Jurgens is my top Superman artist period, Karl isn't that far behind. 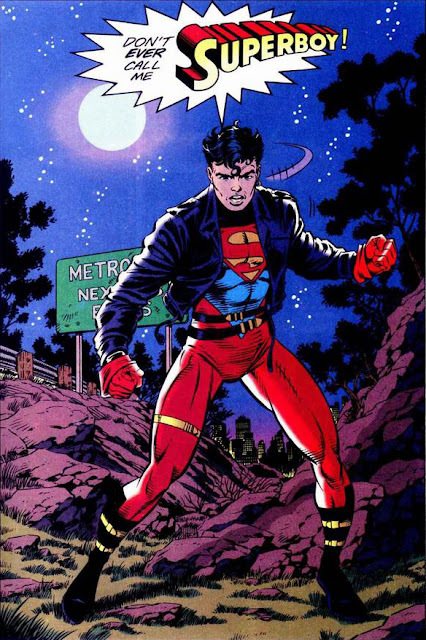 While all the artists involved in Superman's 90's rebirth had pretty distinctive styles, Karl's Superboy never looked right in the hands of anybody else. Like his other work, Karl sowed the characters attitude, powers and story into a clean classic pulp style.